This year’s David Jackson Prize was won by Lincoln University PhD student Wisnu Wicaksono for his article titled “Novel bacterial endophytes from native plants as a new strategy for control of grapevine trunk diseases”. 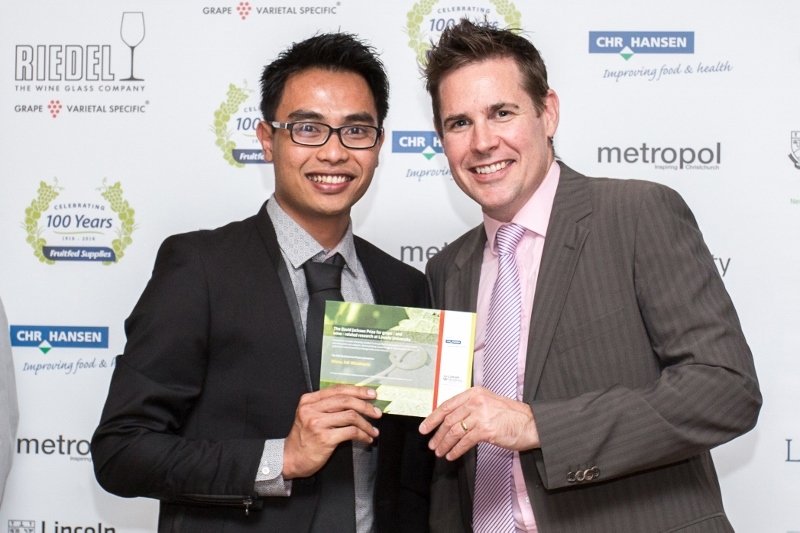 Photograph: Wisnu (left) receiving his award from Duncan Hamm, Regional Technical Manager, APAC – Wine & Fermented Beverages at Chr. Hansen Pty. Ltd.
Wisnu is an ASEAN scholar who was funded to undertake PhD studies in New Zealand following a highly competitive application process run by our Department of Foreign Affairs and Trade. He is due to submit his thesis at the end of 2016 and is supervised by Assoc. Prof. Hayley Ridgway and Dr Eirian Jones. Wisnu’s research project involves characterising the biocontrol potential of beneficial bacteria sourced from the native plant mānuka, a plant recognised for its antimicrobial qualities. One of his most exciting findings is that the bacteria are potential biocontrol agents against some of New Zealand’s most significant plant pathogens. He has demonstrated significant activity in vitro against grapevine pathogens, European canker of apples and the kiwifruit pathogen PSA. He then went on to show that these bacteria can be successfully transmitted to agricultural plant species (grapevines and kiwifruit) where they significantly decrease infection by these pathogens. Thus, they provide strong candidates for commercial biological control as they colonise and persist in planta. Wisnu has presented his work internationally at the “Microbe-assisted crop production – opportunities, challenges and needs” (MiCROPe) conference in Vienna, Austria in November. At that time he has also been invited to spend a week in the laboratory of Prof. Gabriele Berg (University of Graz, Austria) who is an eminent researcher in the area of biological control. Wisnu’s ultimate goal is a post-doctoral fellowship that will lead to a permanent science career in the area of developing and testing new biological control agents for plant pathogens. Can you use a drone in your vineyard?